Like the famous song it inspired, "Manila, I keep coming back to Manila", there's just so many things to love about being here. The food. Culture. People. But when I tried thinking of words that I can associate with this country, or rather city I grew up in, mostly negative adjectives and nouns came to mind. So that wasn't what I want to start with. Rather, than focusing on what needs to be significantly improved I tried to veer towards a more positive road and the recent Philippine slogan came to mind. "It's more FUN in the Philippines" which is very very entertaining and smart. Along with the logo which is FUN, YOUNG and VIBRANT. Definitely geared towards this generation. 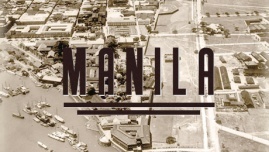 Something sleek, minimalistic, "hipster-ish" was what I thought of at first, but I just love OLD MANILA. So I want to veer towards a more old, retro type of logo. These are the images for my inspiration or mood board. The flower up top is our National Flower and the year below is when Manila was "founded" OR named "Manila". Taking ideas from that era, the fonts used and how their signages usually were, I came up with this. Excuse the uneven lines, my hands were a bit shakey. Should've used a ruler, but then again this is just a preliminary sketch. But still... I should probably lessen my coffee shots. Probably. My jittery fingers are annoying the heck out of me so I decided to use rulers, but I didn't for the borders...which is weird, I know. I then decided to fill-in MANILA. Interestingly enough, I got our National flower wrong. It looks more like this.